I had blogged "Critical issue: Ready to use 90mm Petriplates of Himedia not as per Standard." I don’t have any substantial and validated data to make such clams that this affects the performance of microbiological analysis and this information was posted on my personal judgement. I apologise for this this misinformation and have nothing to profit or benefit from this post. Also don’t carry any prejudice against any manufacturer or organisation. I will be more meticulous in my future post and will not misquote or misinterpret guideline or standards. Why we use 0.45 micron pore size filter in Sterility testing but 0.22 micron pore size filter during filtration? There are different grade and pore size filters are available in the market. But for sterility testing only 0.45 micron pore size filter is recommended in different pharmacopoeias. First question comes in mind that many bacteria are present in the environment which are smaller than 0.45 micron pore size like Brevundimonas diminuta then why don't we use 0.22 micron pore size filter which can retain these small size bacteria instead of 0.45 micron? Can bacteria smaller than 0.45 micron size pass through the filter paper of 0.45 micron if yes then why we are using 0.45 pore size? Can't we use 0.22 micron pore size filter for sterility testing? There are different questions comes in mind and create confusion. What are alert and action limits and why they are so important in pharmaceuticals? In pharmaceuticals alert and action limits are very important. These limits are used to have effective control over the process. Alert Limits: Alert limits are in house limits which are defined based on the trend analysis. These limits are like a barrier before the final action limits, given by different regulatory agencies. We have to be alert if microbial count reach to this alert level. It is not necessary to take any action when count reach to alert limit level but we have to be alert as this is a trigger that something is going wrong within the environment and microbial contamination is increasing in the area. Action Limits: Action limits are also in house limits which are defined based on the trend analysis. When microbial contamination reach to these action limits then action is mandatory to control the contamination in area otherwise if not controlled, we might get area failure. These alert and action limits must be less then the final limits defined by different guidelines and regulatory agencies. For example in case of settle plate exposure, 5 cfu's is the final limit for class B area defined by EU GMP and Drug and Cosmetic act (Schedule M). If we work on this final limit of 5 cfu's then there are chances that we may get more than 5 cfu's in class B and this results in area failure because there is no limit barrier before this final limit. But if we define in house limits like 3 cfu's for alert limit and 4 cfu's for action limits (based on trend data) then we have two barriers before the final limit and there would not be any chance of area failure because if microbial count increases and reach at this in house alert and action limit then we have lot of time to control the area by taking effective action. But if we work with final limits mentioned in guidelines then area results would be either less then 5 cfu's or more than 5 cfu's which means results would be either pass or fail. So, its better to set alert and action limits based on the trend data. What is viable and non viable particle monitoring in pharmaceuticals? In pharmaceutical companies drugs are manufactured in controlled or aseptic areas. So before going to manufacture any product we need to verify the manufacturing environment by monitoring viable and non viable particles. Viable particle monitoring: Viable particles includes bacteria, fungus and their spores and to check the number of these particles we have an environmental monitoring programme which includes Settle plate exposure (Passive air sampling), Active air sampling, Surface monitoring and Personnel monitoring methods. So monitoring of environment by these methods is called viable particle monitoring. By using these different methods we can determine the number of cfu's in particular class of area. Pharmacopoeias and regulatory agencies have defined certain limits of viable particles in these controlled area and number of colony forming units (cfu's) should be less than the final defined limits. If microbes are not with in the limits in the manufacturing area then they may cause product contamination. By using these methods and based on the observations we can assure that the number of cfu's are with in the limits and controlled area is safe for drug manufacturing. Non-viable particle monitoring: In non-viable particle monitoring we check the number of particles of 0.5 and 5.0 micron size. These particles also should be with in the limits. Particular counter is used for the non viable particle monitoring but there is a limitation of this instrument. This instrument can't differentiate between viable and non viable particle. Any particle either viable or non viable if detected by the sensor of this instrument, it will count this particle. If non viable particles increases in a particular area then there will be chance of increase in the viable particle count also because viable particles are not free floating they need a carrier to float from one area to another area. So these viable particles are carried by the non viable particles from one place to another place. So, to control a classified area we need to control both viable and non viable particles. 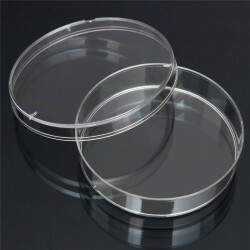 Why Sterility test require 14 days of long incubation time?